CONVOCATORIA Y BASES REGULADORAS DEL VI CONCURSO DE MEDIO DE COMUNICACIÓN "DIVERSIDAD E INCLUSIÓN". PROCEDIMIENTO ORDINARIO Nº 598/2017 A INSTANCIA DE MONICA DENA JARA CONTRA TELECOMUNICACIONES LA HOJA S.L. TITULOS JUDICIALES Nº 76/2017 A INSTANCIA DE EDGAR ANTEZANA MENA CONTRA KHURNA INGENIERIA Y SERVICIOS S.L. 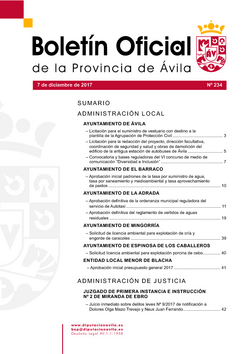 PROCEDIMIENTO ORDINARIO Nº 404/2017 A INSTANCIA DE FUNDACIÓN LABORAL DE LA CONSTRUCCIÓN CONTRA CONSTRUCCIONES Y REHABILITACIONES DGC S.L.